Comprehensive. Flexible. Affordable. 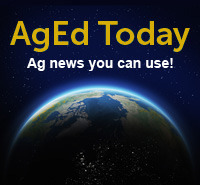 The AgEd Today feature is a must for busy ag teachers and students who want a convenient way to keep up with agricultural news. AgEd Today - agriculture-related stories updated daily during the school year. Don't worry if you miss a day. We keep these files for two weeks. Weekly Current Events Quiz - questions from the week's daily news reports. Answers are only available with teacher passwords. Timely Topics - special reports with links to related AgEdNet.com lessons and other websites. Timely Topics are archived for future use. News Review Worksheet - printer-friendly news review worksheet. Pick a story from AgEd Today, then dig deeper. Some teachers print out the daily news for students to read during the start of class or during roll call. Students can read the news in a computer lab or at their home computer for extra credit. Students preparing for speeches or ag issues competition often print stories related to their topic for background reference and information. The weekly quiz can be used for extra credit points or as part of an independent study program. Use the news review worksheet to help students analyze the news stories they read. Writing answers in complete sentences will help improve writing skills as well.